Abstract: Discontinuous and kinematically unrelated C–S fabrics have been recognized along the contact between the Gemeric and Veporic Units in the Western Carpathians. The formation of S and C fabrics within orthogneiss, quartzite and chloritoid-kyanite schist of the Veporic Unit is associated with Cretaceous syn-burial orogen-parallel flow and subsequent exhumational unroofing. The formation of the two fabrics characterized by distinct quartz deformation microstructure and metamorphic assemblage is separated by an inter-tectonic growth of transversal chloritoid-, kyanite-, ± monazite-bearing assemblage. The monazite U-Th-Pb concordia age of 97±4 Ma was obtained by the laser ablation ICP–MS dating method. The age of this inter-tectonic metamorphic stage together with existing 40Ar/39Ar ages on exhumation of the Veporic Unit indicate that despite the similar appearance to shear bands or C–S mylonites there is a time span of at least 10 Myr between the formation of homogeneous S fabrics and superposed discrete C fabrics in the studied rocks. 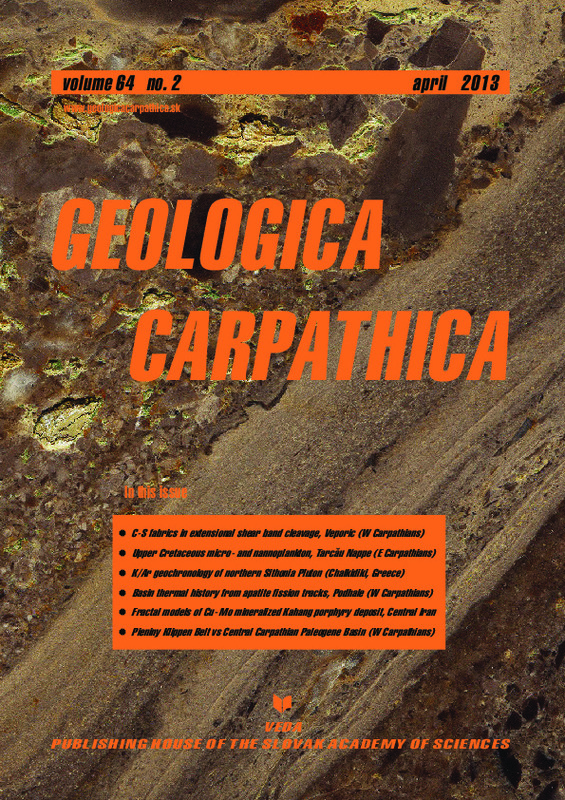 Abstract: Late Cretaceous foraminiferal and calcareous nannoplankton assemblages from the northern part of the Tarcau Nappe, Hangu Formation in the northern Eastern Carpathians are documented in order to reconstruct paleoenvironmental settings and biostratigraphy. The foraminiferal assemblages are dominated by flysch-type agglutinated taxa suggesting bathyal environments, close to the calcite compensation depth (CCD), and mesotrophic to oligotrophic conditions. The morphogroup analyses display variations in tubular and infaunal morphotypes suggesting different levels of oxygenation and seafloor disturbance caused by currents. Reddish hemipelagites containing only agglutinated foraminifera (dominant infaunal forms) occurring in the middle part of the section suggest an increase of water depth and changes in redox conditions. Based on foraminifera, the deposits were assigned to planktonic Globotruncana ventricosa and agglutinated Caudammina gigantea Zones. The first occurrence of Uniplanarius trifidus and last occurrence of Reinhardtites anthophorus demonstrate the presence of Late Campanian UC15cTP–UC16/CC21–CC23 calcareous nannoplankton Zones. Foraminiferal and nannofossil assemblages in the red beds have a high potential for stratigraphic correlation on a regional scale. Abstract: New K/Ar mineral ages of thirty nine samples (biotite, muscovite, K-feldspar) from the two-mica granodiorite to granite and leucogranite of the northern part of the Sithonia Plutonic Complex (Chalkidiki, Greece) are given in the present study. These data along with existing Rb/Sr mica and U/Pb zircon ages are used to investigate the thermal history of the plutonic complex and shed light on the process that affected it, and caused discordant Rb/Sr and K/Ar mineral ages. The K/Ar mineral dating yielded ages ranging from 38 to 49 Ma for muscovites, 32 to 47 Ma for biotites and 37 to 43 Ma for K-feldspars, respectively. The comparison of the K/Ar, Rb/Sr and U/Pb mineral ages and the closure temperatures of the different isotopic systems for the different minerals indicate a rapid cooling rate for the Sithonia pluton. The latter supports the hypothesis that the pluton was formed in a post orogenic extensional regime. Moreover, the K/Ar mineral isochrones indicate that a reheating of the pluton took place before 37 Ma and partially rejuvenated the K/Ar and Rb/Sr isotopic system of the minerals. Abstract: The thermal history of the Paleogene Podhale Basin was studied by the apatite fission track (AFT) method. Twenty four Eocene-Oligocene sandstone samples yielded apparent ages from 13.8±1.6 to 6.1±1.4 Ma that are significantly younger than their stratigraphic age and thus point to a post-depositional resetting. The thermal event responsible for the age resetting is interpreted as a combination of heating associated with mid-Miocene volcanism and variable thickness of Oligocene and potentially also Miocene sediments. Extending the mid-Miocene thermal event found in the Inner Carpathians into the Podhale Basin as a likely heat source suggests that the amount of denudation in the Podhale Basin determined only on the basis of heat related to the thickness of sedimentary sequence might have be significantly overestimated. Two samples from the western part of the basin that yielded 31.0±4.3 and 26.9±4.7 Ma are interpreted as having mixed ages resulting from partial resetting in temperature conditions within the AFT partial annealing zone. This observation agrees very well with reported vitrinite reflectance and illite-smectite thermometry, which indicate a systematic drop of the maximum paleotemperatures towards the western side of the basin. Abstract: This study identifies the major mineralized zones including supergene enrichment and hypogene enrichment in the Kahang Cu-Mo porphyry deposit which is located in Central Iran based on subsurface data and utilization of the concentration-volume (C-V) fractal model. Additionally, a correlation between results achieved from a C-V fractal model and geological models consisting of zonation, mineralography and alteration have been conducted in order to have an accurate recognition and modification of the main mineralized zones. Log-log plots indicate five geochemical populations for Cu and Mo in the deposit which means that mineralization commences with 0.075 % and 13 ppm for Cu and Mo (as the first thresholds) respectively. The main mineralization began for Cu≥0.42 % and Mo≥100 ppm and also enriched mineralization containing Cu≥1.8 % and Mo≥645 ppm which is located in the central part of the deposit. According to the C-V model, the main Cu-Mo mineralized zones occur in the hypogene zone, especially in the central, NW and NE parts of the Kahang deposit. The supergene enrichment zone derived via the C-V model is smaller than that in the geological model and is located in the central and eastern parts of the deposit. Results analysed by the C-V fractal model certify that the interpreted zones based on the fractal model are accurate. To certify this, a logratio matrix has been employed to validate the C-V fractal model for the Cu and Mo main mineralized zones. Abstract: An exceptional, briefly exposed section across the boundary between the Pieniny Klippen Belt (PKB) and the Central Carpathian Paleogene Basin (CCPB) in Eastern Slovakia showed that the contact is formed by a single, subvertical fault plane. Whereas the Oligocene CCPB deposits exhibit only weak deformation with S-verging fold-and-thrust structures, the Cretaceous PKB sediments are internally strongly sheared with scaly fabric and numerous calcite veins. It is inferred that the PKB suffered strong thrusting- and wrenching-related deformation in pre-Oligocene times, while the Early Miocene oblique backthrusting resulted in exhumation of the PKB and formation of its steep fault boundaries.